trimming. These specimens always look good, appears to be clean, and doesn’t really get much in the way of bugs. During the fall I notice purple/ black colored berries that are attractive to birds. 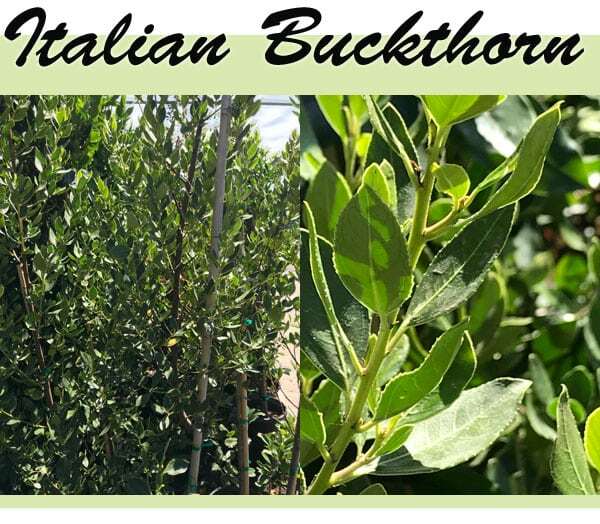 Italian Buckthorn is botanically known as Rhamnus alternus and is related to California’s own Wild Lilac or Ceanothus and the popular fruit, Jujube. It is native to the Mediterranean region from Portugal to southern Spain, France, Italy, Albania, and Greece where it is found growing below 2,300 feet in elevation in the Maquis or scrubland, similar to the chaparral where Wild Lilac or Ceanothus grow in the Southern California mountains. Being native to this part of the world means that it is a prime candidate for growing in our Southern California climate. It is widely adapted and would thrive anywhere from the mountains to the desert, and even seacoast conditions. It tolerates wind, is hardy to 10 degrees f.,does well with little no water once fully established but also accepts regular waterings, and can grow successfully in most soils as long as there is no standing water. Italian Buckthorn sports some amazing qualities that shouldn’t be missed. You can grow it for its form, foliage, and utilitarian needs as a durable and reliable hedge or screen plant that provides needed blockage and privacy. This evergreen shrub grows quickly and dense 10 to 20 feet high. It can grow in full sun to part shade and is an excellent choice for a plant that can reach 2- 3 feet in the first few years after it is established depending on care and conditions, for instance when you irrigate more regularly it will grow faster. This selection also takes well to shearing and shaping, meaning that it can be kept lower than the previous specified height. Italian Buckthorn can also be trained into an attractive multi-trunked or single stemmed tree. This species is also long lived and a nearly indestructible shrub. When planting Italian Buckthorn, it is best to dig a hole 2 times the width of the root-ball and 1 to 1 1/2 times the depth. Next, sift and break up all the clods of soil. Now, set the rootball at ground level. 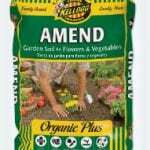 It is time to prepare the soil mix with equal parts sifted soil and soil amendment, I prefer Kellogg’s Amend. Then, backfill with amended/ sifted soil, finally build a watering basin around the plant, and then water thoroughly. What I like about Italian Buckthorn is that it has non-invasive deep roots that are good for erosion control on slopes, gives you a “woodsy feeling”, fire resistant, and is decorative. In the landscape this strong, upright growing plant makes a striking backdrop to lower growing flowering plants below it. You can also use it with other Mediterranean plants like Rosemary, Olive, Fig, Italian Cypress, Lavender, Marina Strawberry Tree, and Crepe Myrtle. You can also use Italian Buckthorns compact leaves for cut foliage in flower bouquets. A lower growing variegated form is an option with attractive light green and white leaves that could be used for interest in the garden. Come by your favorite Green Thumb Nursery, we have a great selection of excellent privacy shrubs for your to choose from, we would love to help you out.